More guns, less crime — that’s the conclusion of a recently-issued report from the Crime Prevention Resource Center (CPRC). The CPRC Concealed Carry Report attributes some of the drop in crime rates to the fact that more Americans than ever before are carrying handguns for protection. In the past eight years, the number of concealed handgun permits has soared, growing from 4.6 million in 2007 to over 12.8 million this year. Overall, 5.2% of the U.S. adult population, i.e roughly one in twenty American adults, now has a concealed carry permit. 5.2% of the total adult U.S. population has a concealed carry permit. The number of concealed handgun permits is growing at an ever-increasing rate. Over the past year, 1.7 million additional new permits have been issued – a 15.4% increase in just one single year. This is the largest ever single-year increase in the number of concealed handgun permits. Five states now have more than 10% of their adult population with concealed handgun permits. Between 2007 and 2014, murder rates have fallen from 5.6 to 4.2 (preliminary estimates) per 100,000. This represents a 25% drop in the murder rate at the same time that the percentage of the adult population with permits soared by 156%. Overall violent crime also fell by 25 percent over that period of time. States with the largest increase in permits have seen the largest relative drops in murder rates. 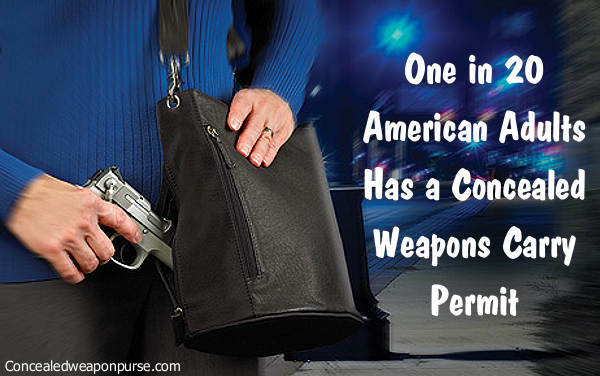 Interestingly, concealed handgun permit holders are extremely law-abiding. In fact, police officers commit crimes at a higher rate (103 per 100,000, national average) than do concealed carry permit holders in Florida (12.8 per 100,000) and Texas (22.8 per 100,000). 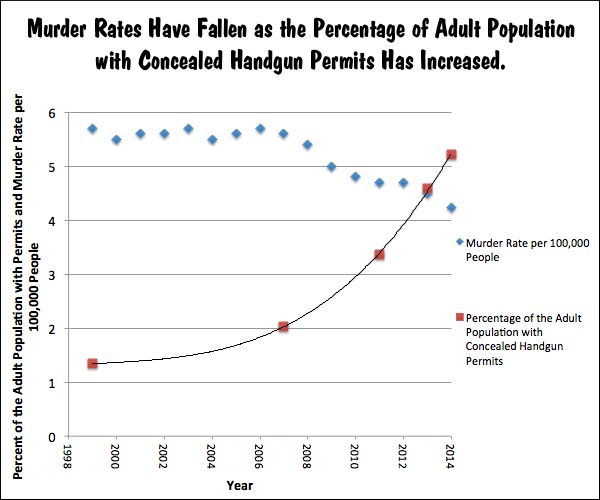 Share the post "Big Growth in Concealed Carry — 5% of Americans Have Permits"